While it’s the number one activity on the web, social media still requires more than a college student with a large Facebook following to develop an effective social media marketing strategy. 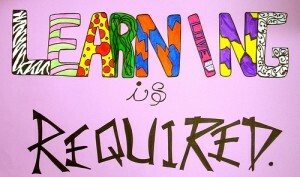 It requires knowing your products, brand and business. Further, social media must be integrated into your overall business plan. Here are thirteen social media related facts and what they mean for your marketing. Roughly one quarter of online time is spent on social media platforms according to Nielsen. Social media is used to communicate and engage with family and friends. Bottom line for marketing: Must be present on social media platforms since that’s where your target market is. At a minimum, listen to what’s being said about your company, brands, products, key executives and your competitors and respond where necessary and appropriate. 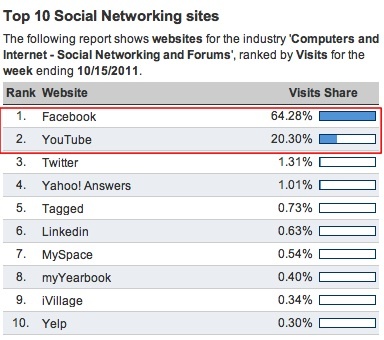 Facebook and YouTube dominate social media platforms by a lot according to Hitwise’s ranking. Bottom line for marketing: Assess whether Facebook and/or YouTube make sense for your offering and market segment. Consumer reviews are the preferred source of product information. 60% of consumers use multiple online sources to research purchases. Most notable is the over 60% who look for customer reviews and a similar number who contribute reviews. Additionally, among those who share brand-related opinions on a social media platform, about two out of five do so to get a discount or coupon. (Chart Source: Nielsen) Bottom line for marketing: Pay attention to consumer reviews and respond where appropriate since consumers seek product reviews, on your site, third party sites or your competitor’s site. Further, ensure that if you have reviews on your site they’re product, not service focused and that they contain unique content to support your search optimization. About 40 million US mobile users, more 50% of the mobile social media audience, access social media sites almost every day based on comScore data. This continued increase in usage reveals the importance of social media to people’s daily lives. Bottom line for marketing: Consumers use social media networks whenever and wherever they are to communicate and gather purchase related information from sources they trust, even when they’re in your store or your competitor’s establishment. Therefore, ensure you have the appropriate information and content available for a variety of devices. One out of three of the mobile social media participants has received a coupon or deal or clicked on a social media ad. 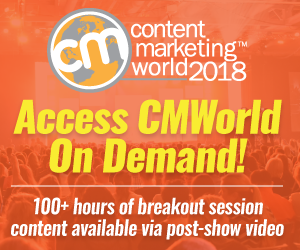 This underscores the need to be on the platforms where your prospects and customers are interacting and/or searching—on their timetable, not yours! 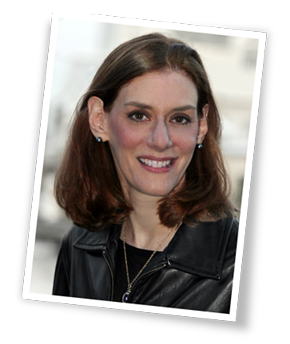 Further, consider where they are and what’s causing them to look for information. Do you know if they are shopping? Bottom line for marketing: Provide a streamlined mobile presence, even if you’re an online only etailer. Also, consider whether it’s worth advertising on appropriate social media platforms with related targeting. No matter how you look at it, Facebook’s social media’s 900 pound gorilla. If it were a country, Facebook would be the third largest country in the world after China and India. Facebook reaches almost three quarters of the U.S. Internet population every month according to comScore. This means Facebook growth is maturing so most new growth in the U.S. will come from increased usage rather than new members. Facebook is succeeding in this regard since the average U.S. visitor engagement grew over 35% during the past year to 6.3 hours per month. Bottom line for marketing: Develop a way to interact with prospects, customers and fans on Facebook if you’re organization has a consumer focus since this is where your audience is. This only works if your fans are willing to acknowledge their association with you. It wouldn’t work if you’re a gynecologist, for example. Facebook accounts for one out of every three U.S. online display ads based on 1Q2011 data as reported by comScore. Given Facebook’s strong usage across devices and across age groups, it’s no surprise that it’s become a significant player in the online advertising field. Bottom line for marketing: Assess Facebook advertising effectiveness for your online advertising display plans. Don’t overlook the potential for other types of social media advertising. Also, think outside the box in terms of sponsorships and co-creation of content. 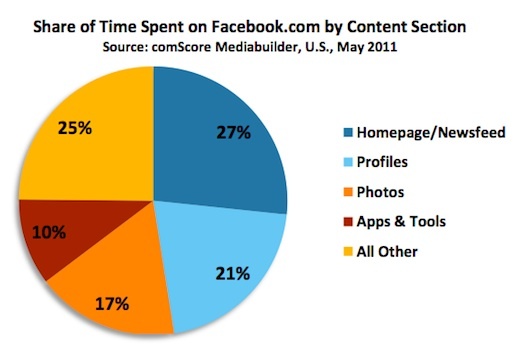 Over one quarter (27%) of Facebook time is spent browsing the newsfeed based on comScore data. By contrast, for the top 100 Facebook brand pages, the average page only reaches one out of six fans per week, if they post every day. Translation: Time and marketing are needed to support an active Facebook page for the desired results. Bear in mind that reaching a fan doesn’t necessarily mean purchase. Bottom line for marketing: Optimize your Facebook newsfeed for your brand’s presence to stay top of mind with your target audience. YouTube is the number two social media platform, clocking in 9.1 billion minutes in the month of September according to Nielsen. In addition, it’s the number two search engine after Google (And, yes, it’s owned by Google.) Bottom line for marketing: Expand your marketing mix to include video to help your social media reach and search optimization. Think beyond talking heads. 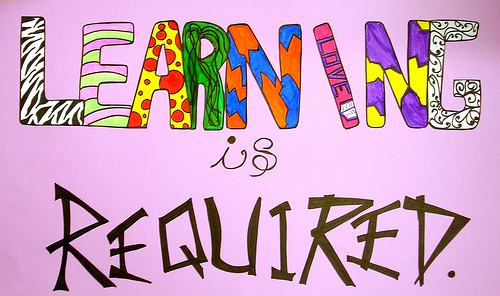 Use video to attract and engage your audience with education or humor. If you’re thinking “What’s Tumblr?”, it’s time to get up to speed because this microblogging site has quietly slipped onto the social media shortlist. 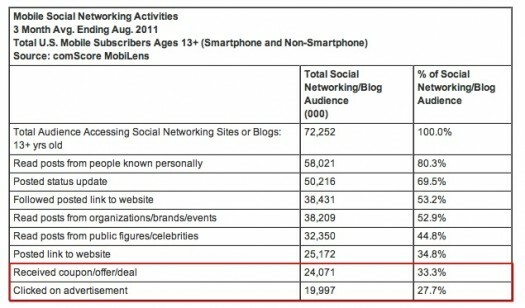 Tumblr is the third largest social media platform with 623.5 million visitor minutes in May 2011 according to Nielsen. 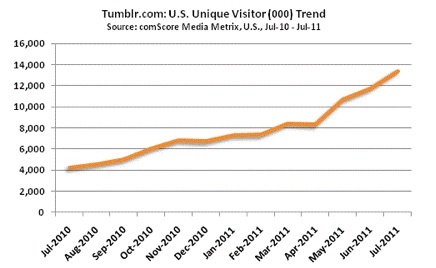 Based on comScore, Tumblr had over 60% growth in visitors during the last three months. Bottom line for marketing: Start experimenting with Tumblr, especially if you’ve got products that lend themselves to photography and graphics. Half of Tumblr’s user base is under 25. 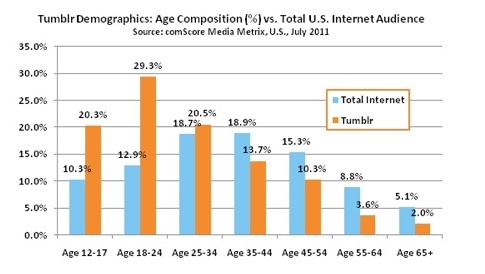 Since the sweet spot of the Tumblr demographic is 18-24, it’s a favorite with entertainment and fashion firms like MTV. Bottom line for marketing: If you’re in the teen/twenty something market, Tumblr’s a must-have addition to your social media mix. Remains the dominant microblogging site for communicating in 140 characters or less. Twitter.com visitors grew to 27 million in May 2011, an over 10% increase from the prior year. (Note that, while much Twitter usage occurs off of Twitter.com, comScore indicated that approximately 85-90% of Twitter users visit the website each month.) 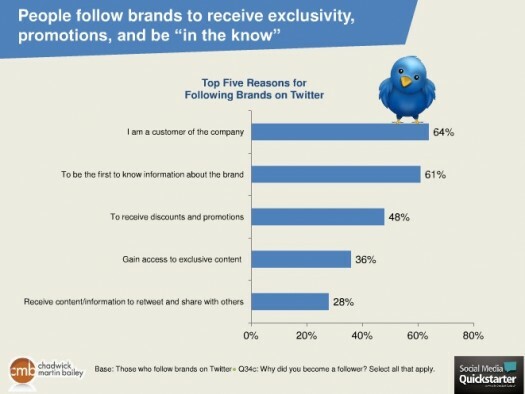 Bottom line for marketing: Depending on your audience, Twitter can be effective for communicating with prospects and customers. It’s not good for teens and young twenty-somethings since they don’t frequent Twitter. If you’re a retailer, consider whether a deal of the day makes sense or use Twitter to extend your customer service. Started as an enhanced rolodex, LinkedIn continues to expand its functionality. LinkedIn still remains a job-hunting resource. 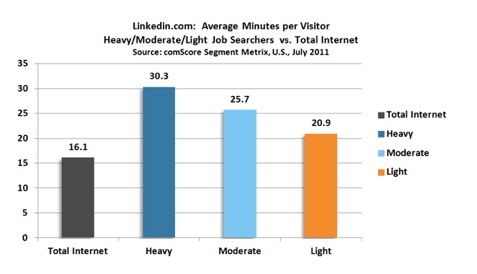 While LinkedIn has grown almost 60% in past year, the average Internet user spends 16 minutes per month there. Bottom line for marketing: Don’t underestimate LinkedIn’s importance especially as it evolves following its IPO last spring. LinkedIn is a content haven that can be effectively used by B2B marketers and solopreneurs. Regardless of how you look at it, social media isn’t a flash in the pan that you don’t need to integrate into your marketing. But before you run after the next shinny technology, it’s important to determine what each social media platform does and how it fits into your overall marketing plan. It isn’t one size fits all. Is there any other significant social media information that marketers should consider? If so, what is it and why should marketers pay attention to it? Tags Chart, data, Facebook, LinkedIn, Research, TUmblr, Twitter, YouTube. Bookmark the permalink. Great stats. Question. 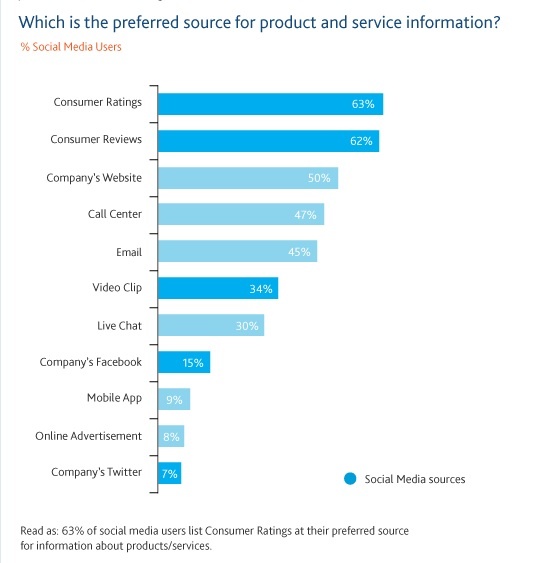 What’s the data source of the “Consumer reviews are the preferred source of product information” chart?